Manufacturer of a wide range of products which include large water tender, combined dcp tender and combined foam tender. 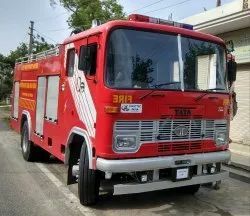 Large Water Tender type "A", Type "B" And Type "X" are used basically in City area. for his 4500 liter water capacity that vehicle more efficient to fight against fire in Cities. 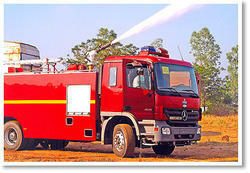 The Water Tender is provided in various customization options & also given with numerous specifications to choose from. Chassis:- Fabricated on Tata 1613, Tata 1212, Ashok Leyland 1616 or customize vehicle Etc. Pump:- Single stage centrifugal fire pump of 2250-4000 Lpm @ 7 to 8.5 Kg/ Cm2 With semi or fully automatic priming system (tested at 7 meter deep lift priming in 24 second). Power take off: - In line full torque P.T.O. Imported and Indigenous make suitable for chassis manufacturer. Water Tank: - 4500 liter Made By Mild and stainless Steel. Water Monitor: - Water monitor 1800 Lpm throw rate with 35 meter throw in horizontal plane. First aid hose reel: - Optional normal pressure hose reel with shut off nozzle 30-60 meter length. Locker: - 2-4 Nos. of Shutter or Door type locker for easy carrying for supporting accessories. Ladder and ladder gallows: - Vehicle equipped with 7.5 meter extension ladder on roof with suitable gallows. Combined DCP Tender: - Combined DCP Tender is used basically in Refineries, petrol and chemical industries and energy sector. For its 4500-6000 liter water and 500 liter foam with 1000-2000 kg DCP powder capacity that vehicle effectively fight against fire in any situation. The Combined foam Tender is provided in various customization options & also given with numerous specifications to choose from. Chassis: - Fabricated on Tata 2516, 2521, Ashok Leyland 1616, 2518 or customize vehicle Etc. Pump:- Single stage normal or multi pressure centrifugal fire pump of 1800-4000 Lpm @ 7 to 8.5 Kg/ Cm2 in normal pressure mode and 200-300 lpm @ 35 kg/Cm2 in high pressure mode With semi or fully automatic priming system (tested at 7 meter deep lift priming in 24 second). Water foam Monitor: - Water monitor 1800 Lpm throw rate with 35 meter throw in horizontal plane. Foam Tank: - 500 liter foam tank made by stainless steel (optional). First aid or High Pressure hose reel: - Optional normal or high pressure hose reel with shut off nozzle or fog jet gun 30-60 meter length. DCP Powder Vessel: - 2X1000 or customize DCP vessel For DCP arrangement with 2 Nos. 25 mm 30 Meter DCP hose reel with shut of nozzle. Expellant Gas: - Suitable number of NO2 cylinder for discharge of DCP with 100% spare cylinder. DCP Monitor: - A DCP monitor provided on the roof. Ladder and ladder gallows: - Vehicle equipped with 10.5 meter extension ladder on roof with suitable gallows. Combined Foam Tender: - Combined foam Tender is used basically in Refineries, petrol and chemical industries and energy sector. 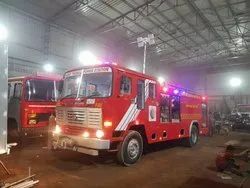 For its 4500 liter water and 2000 liter foam with Dry chemical powder and Carbon-di-oxide extinguisher with high pressure water mist system that vehicle effectively fight against fire in any situation. The Combined foam Tender is provided in various customization options & also given with numerous specifications to choose from. Pump: - Single stage normal pressure centrifugal fire pump of 1800-4000 Lpm @ 7 to 8.5 Kg/ Cm2 With semi or fully automatic priming system (tested at 7 meter deep lift priming in 24 second) and additional high pressure pump of 150 Lpm @ 100 bar capacity. High Pressure hose reel: - High pressure hose reel with 2 Nos. Water mist fog and jet gun 60 meter length. Carbon-Di-Oxide Extinguisher:- Two set of total 135 kg each of 22.5 kg CO2 extinguisher with 16 mm bore size and 30 meter hose length of discharge capacity 45 kg/cm2 provided in locker. Looking for Water Tender ?